Carbon data records from the KEO and Papa sites are archived and made available through the Carbon Dioxide Information Analysis Center (CDIAC). 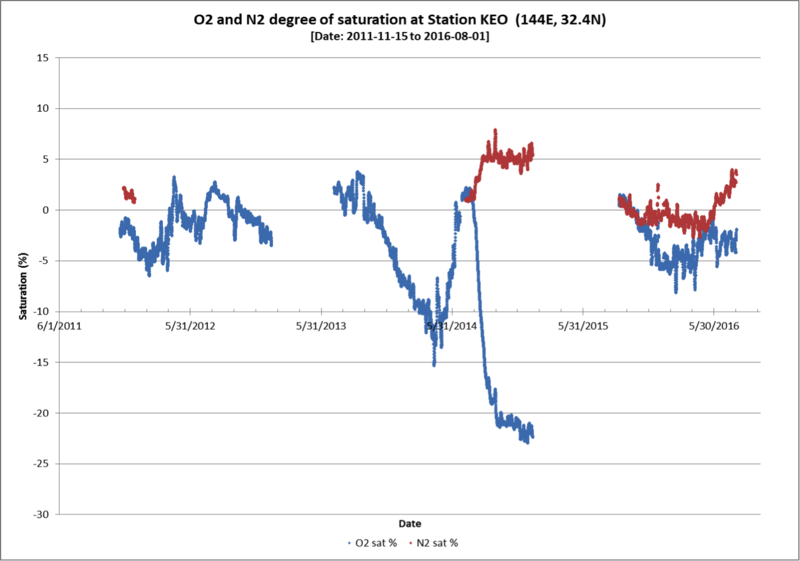 Carbon data from the ARC deployment are not yet available. Data sets for pH, turbidity, and chlorophyll fluorescence are not yet available online. 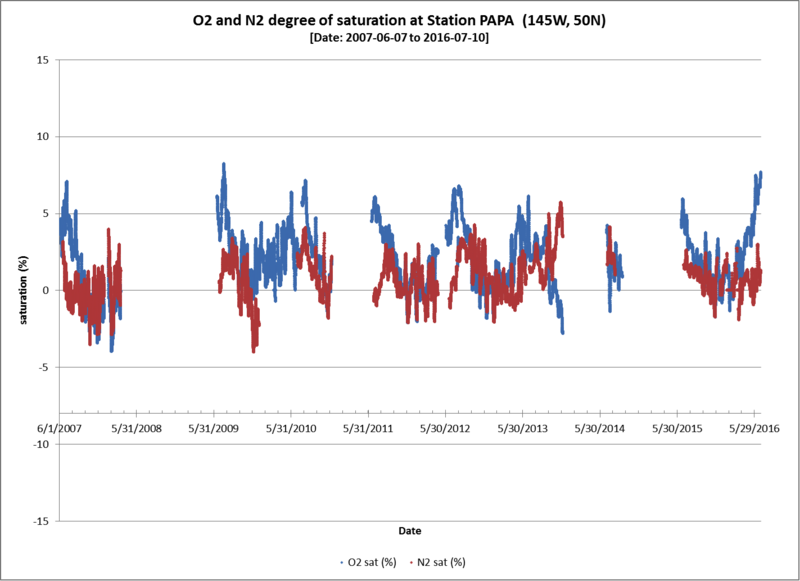 Please contact Dr. Adrienne Sutton (adrienne.sutton@noaa.gov) for data. A Waverider mooring has been deployed near the OCS Papa mooring since 2010. 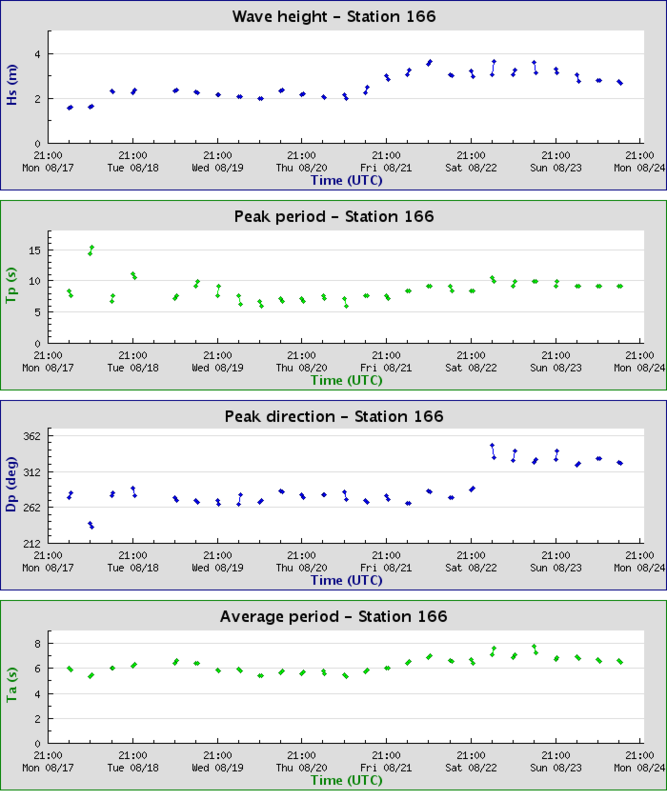 Wave height and wave period data from this mooring may be viewed through the CDIP website here. A sample plot is shown in the right sidebar. 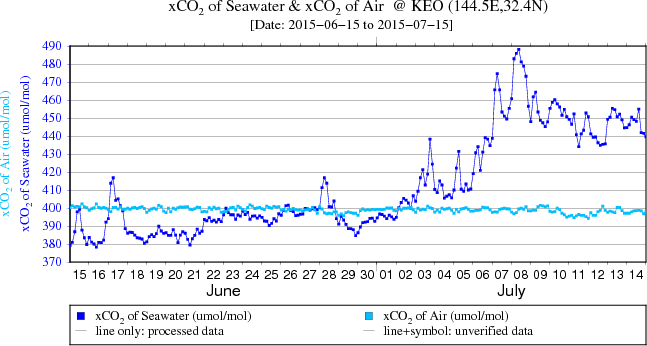 Gas tension and dissolved oxygen data from KEO and Papa are available through the NOAA OCADS website. Please contact Dr. Steve Emerson (emerson@washington.edu) with questions. Seaglider autonomous vehicles surveyed near the OCS Papa mooring during 2008-2010. Seagliders collected profiles of temperature, salinity, oxygen, backscatter, and fluorescence, along with estimates of depth-average currents, in the top 1000 m. Bin-average profiles, currents, and oxygen calibration data can be found at the UW Researchworks archive here. If you are a MATLAB user, code that illustrates how to download and plot these data can be found here. Profiles without bin-averaging can be found at the NODC (here, here, and here). Please contact Noel Pelland (nap2@u.washington.edu) with any questions. If you use these data, please cite Pelland, Eriksen, and Cronin  JGR. These data were funded by NSF grants OCE-0628663 and OCE-1129090. 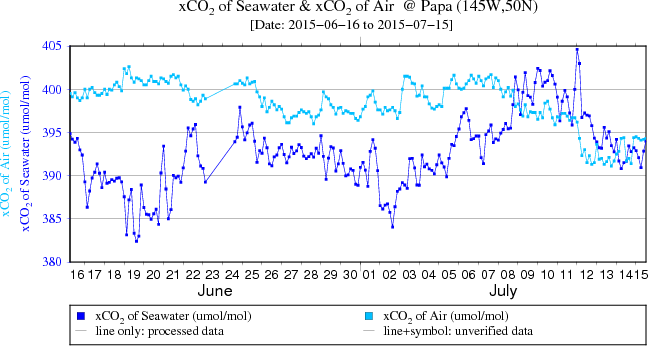 Sample plot of CO2 data from the Papa mooring. See links at left for most recent data plots. Sample plots of wave heights at Papa. Click link to examine the plot for this week.